Everything you need to fight an unfair ticket! We’ve all received one — a traffic ticket that seems completely unfair, the result of an officer’s evening quota rather than a serious moving violation. But do you have to pay the penalty and watch your driving record crash and burn? Not if you choose to fight back with Beat Your Ticket. The 6th edition is extensively updated to reflect your state’s current traffic laws and court procedures. David Brown practices law in the Monterey, California area, where he has represented both landlords and tenants in hundreds of court cases — most of which he felt could have been avoided if both sides were more fully informed about landlord/tenant law. Brown, a graduate of Stanford University (chemistry) and the University of Santa Clara Law School, also teaches law at the Monterey College of Law and is the author of Fight Your Ticket (CA version), Beat Your Ticket (the national version), The Landlord’s Law Book, Vol. 1: Rights and Responsibilities; The Landlord’s Law Book, Vol. 2: Evictions and co-author of How to Change Your Name in California and The Guardianship Book for California. 1. Keep your inspection sticker up to date. An out of date sticker is a big red flag waving “Pull me over and check me out”! 2. On that note, make sure your license is not expired and your car registration is up to date as well. 3. “Click it or Ticket” – Wear your seatbelt. Cops can see you and your passengers and can pull you over for it. 5. Check your lights and cars exterior – you can get pulled over for a headlight or tail light out, driving with your headlights off at night or in the rain, etc. 1. Be nice to the police officer: Be nice to the officer… but don’t forget to argue, respectfully, when you know you’re right or if there is a legitimate reason or cause for the violation, such as avoiding an accident or not being able to see the light change ahead due to a large vehicle in front of you. Police organization support stickers and cards help too. 2. Just Admit It: Admit what you did wrong if you’re the guilty party. For example, if there is a family emergency and you are hurrying to get home, tell the officer – he/she may let you off and try to be helpful in the process. But be honest. 3. Come prepared with evidence: One person got his ticket dropped thanks to proof shown on Google Maps; if traffic signs were obscured or damaged, your ticket might get dropped as well. 4. Talk to the prosecutor before court is in session: If you’re willing, you might be able to strike a deal where you can pay the fine without getting the points. You win some, you lose some. You can also get a good attorney to fight for you. 5. Don’t violate any traffic laws in the first place and be familiar with NJ traffic laws. And of course avoid the easy to get violations – not wearing your seat belt, talking on the phone, keep your car’s inspection and registration up to date. Driving under the Influence and Driving while Intoxicated are serious violations in the State of New Jersey, and even though should you never drive under the influence or while intoxicated because it puts your life and the lives of other people at risk; there may be a day when your judgment is impaired and you find yourself driving under the influence and consequently, being pulled over by the Police. It is important to note that intoxication in the State of New Jersey isn’t just alcohol intoxication, it can also be other substances that are illegal or prescribed. It is important to be prepared if you are charged with a DUI and/or DWI, because you can fight these charges in NJ. When charged with a DUI or DWI in NJ, you need a good lawyer who is knowledgeable in the criminal justice system. If you are stopped by a Police Officer who suspects that you are under the influence in New Jersey, you will be required to carry out some road side tests. You may also be asked incriminating questions with no Miranda advisement of rights, and with no right to talk to an attorney. If the Police Officer thinks that you are under the influence, you will be arrested for a DUI and/or DWI in NJ. Once you are arrested, you will be videoed at the police station, while you are questioned further. After you have been arrested, you will also be asked to undergo breath and blood tests, usually at the police station. A knowledgeable DUI/DWI defense attorney in New Jersey knows that sometimes the breathalyzers used are incorrect or unreliable, and that some of the Police Officers who use these devices are not familiar with the correct procedures. If the breathalyzer shows that you are over .08%, if there is a blood sample rejected, or you refuse to be tested, then you will be reported and the Police will remove your license and provide you with a Notice of Suspension. When you choose an attorney to deal with your case, you need to choose someone who is properly educated, skilled and committed to fight your DUI and/or DWI charge in NJ. Going to court can be stressful, and you need to know that the lawyer defending you is experienced at defending DUI and DWI charges. Your lawyer needs to know when to stand up on your behalf, and when to negotiate. Additionally, learn your case and take the time to fully understand your actual charges. When you go to court with the proper knowledge of the court procedures and the law, it will make you more prepared and the court will take you more seriously. It will also prepare you for the possible consequences, and how the outcome may affect you. If you invest the time and effort to study your legal needs, then it will help with any future proceedings. Conducting a Google search will provide resources that can give you pertinent knowledge pertaining to your case. Additionally, make sure you dress appropriately for court by wearing business attire, i.e. a suit. Business attire portrays professionalism and reflects to the court that you are taking the charges seriously. Do not appear in court wearing jeans and a t-shirt, as this shows that you are not taking your DUI/DWI case seriously and that you are unprofessional. Don’t be foolish and believe that you cannot defend against DUI and/or DWI charges that you may receive. Fighting a DUI/DWI in NJ will usually enable you to receive a reduction of charges and/or fines. The Judge will see that you have invested time and effort in your case and will probably look at your case with a little leniency, as compared to someone that doesn’t defend their case properly or take their case seriously. Many people want to know how to fight a traffic ticket, but they usually try to do it themselves. The best way to fight a traffic ticket is by hiring a traffic ticket attorney. Traffic Ticket Attorneys specialize in fighting traffic tickets for speeding, improper turns, accidents and other infractions. Before going to court to fight the ticket, you should contact an attorney and find out what your outcome could possibly be if you were to hire him or her. There is one thing that a person can do for themselves at the time a traffic ticket is being issued; take down notes that will help the traffic ticket attorney defend your case. Note the time of day, the weather conditions, and where the sun is if it is an accident. Note the speed limit sign and where it is located to where you were stopped. If it is an accident, make sure to survey the area and the other car. Drivers can do one thing to help in any situation. Carry a disposable camera in the glove box. If something were to happen, you will have a camera to take pictures that might help with your case. Sometimes, a driver cannot see things in the pictures that an attorney can see. Traffic Ticket Attorneys are trained to look for the obvious and work from there. If you feel your speedometer was correct and the Officer that stopped you was wrong, take your car immediately to a garage and have the speedometer read. This information will help an attorney defend you in a case where a speeding ticket was issued. Should You Fight Your Ticket in Court? Okay, you ran that stop sign, failed to yield, sped in a school zone, and had a broken tail light; then to top it off, you forgot your wallet at home and your insurance card is expired! To make matters worse, because you argued with the Officer, or he was having a bad day, you were cited for every single offense. So, do you pay the fines, or take your chances in Traffic Ticket Court? Your best bet is to go to court with a competent Traffic Ticket Attorney. When I was 18 and received my first traffic ticket for speeding, I made the mistake of just paying for the fines through the mail; and then found out from an angry phone call from my mother, that I received 4 points on my license and her insurance rate went up. The next ticket I received, several months later, I fought and received no points; but I did have to pay a fine (which is minimal compared to what your insurance company charges for having points on your license). Additionally, you never know what the Judge will order, or what the District Attorney may offer you. Usually, at the very least, they will let you pay a reduced fine for not having the proper documentation at the time of the incident, if you bring the proper documentation with you to court. Can’t afford to pay the fine? Community Service and payment plans are also options. In addition, if the Officer fails to show up at your trial, they may drop the charges altogether. However, in most cases, the charges are reduced, and sometimes even dropped, even if the Officer appears in court. If you decide to fight a traffic ticket there are a few things you should do immediately. First, when confronted by a Police Officer, remain calm and polite. Next, you should never admit to any negligent or criminal act. If you admit guilt at the time, such as saying you were speeding, it will be much harder to fight the ticket later. Finally, take notes and record any pertinent information. 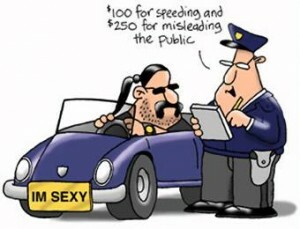 For example, ask the Officer for the specifics of how he established the speed you were driving, or what law you broke. If there is physical evidence such as a speed limit sign that is clearly obstructed by foliage or paint, take a picture of the sign. There are several instances when a traffic ticket attorney would be beneficial in your quest to fight a traffic ticket. If you are out of your home state and receive a traffic ticket, it may be inconvenient or even impossible for you to travel back to the state that issued the ticket to appear in court. If this is the case, then a traffic ticket attorney could attend the court proceedings and plead your case for you. Even if you are close to home, there are some serious traffic tickets that it is best to hire a traffic ticket attorney for. If you have received a ticket for driving under the influence, an attorney is almost always needed. Additionally, tickets issued for accidents and driving without a license are more complicated, and a traffic ticket attorney can help you throughout the process of reversing or reducing your ticket. Getting a Speeding Ticket in NJ can be a real hassle; instead of saving time by driving over the speed limit, when it comes down to it, you are doing the complete opposite. Speeding tickets mean time spent pulled over waiting for the Police Officer, a possible lengthy vehicle search, the cost of the speeding ticket, and of course, the rise in your car insurance premiums. There are ways, however, that you can go about fighting a Speeding Ticket in NJ. First of all, never admit to your personal guilt of anything. Often times when you are pulled over, the first question the Officer will ask is how fast do you think you were going? Don’t incriminate yourself, if you admit to speeding at this point in the encounter, there really is no way of fighting it; in essence you’ve already plead guilty to the charge, and have no choice but to pay the ticket. Instead of answering the Officer’s question with an admission of guilt, respond with a question of your own. Ask the Police Officer if he or she has your speed on radar, and ask him or her how fast you were going according to the radar. Sometimes Police Officers do not use radar at all; instead they may use their “keen eye” to spot potential speeders, and hope that when pulled over, the violator will foolishly admit to speeding. If you and the Officer have moved past this stage and he or she has already given you a speeding ticket, the next best thing you can do is defend yourself in court. Sometimes, Police Officers will not show up when summoned for a court appearance, especially for something as mundane as a speeding ticket. After all, to appear in court, the Officer has to take time from work, just like you do; this really is the best way to fight any speeding ticket. Sometimes you will get lucky and the Officer will simply let you go with a warning. Reasons for this vary, and in reality it seldom happens; one should never expect to be let off with only a verbal warning. You can improve your chances, however, by being polite to the Police Officer, cooperating with him or her, and providing all of the information and/or documentation that is required, such as your driver’s license and proof of insurance. 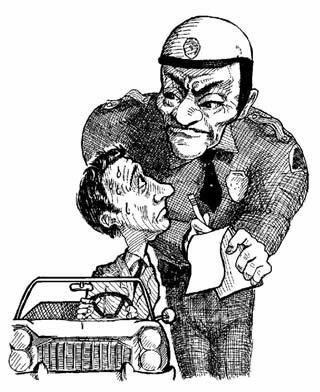 Often receiving a traffic ticket is a black and white offense. You knew what you were doing (racing to work, talking on your cell phone without a hands-free device, or cruising through a stop sign), and while a smile and apology might get you a warning once in awhile, the probable outcome is a traffic ticket. Sometimes, however, the situation is not so clear cut. If the violation seems unclear, it is worth looking into further. Offenses which rely solely on the Officer’s judgment or visual range, were a result of a recent change in signage or truck blockage, or were created due to a natural obstacle, such as swerving to avoid an animal in the street, can be challenged. This requires a careful look at the situation on your part, perhaps even a consultation with a traffic ticket attorney. If you “need” to fight the ticket because of concerns relating to insurance rates, or DMV and court records and want the best chance of dismissal, a traffic ticket attorney may be the best way to go. If you just want to “try” to fight the ticket, self representation is not a bad idea. Make sure you bring any photos or professional looking intersection drawings that you can create to add credibility to your viewpoint. Consider the small factors, such as paint erosion or new signage. Relive the experience – were you speeding because you were experiencing chest pain and were trying to get to the hospital? Did you ask the Officer for help and receive a rebuff? All these factors add up and can make or break your judgment. Hopefully you won’t find yourself in need of this advice for a very long time. Drive safe and good luck.